This is the sketch map on the late afternoon of day 3 upon reaching the top of the first mountain. This is made mostly using the incredible distance vision of the two bird familiars. Smoke coming from the jungle in an area on the coast, to the south about 70 miles away. From what you can tell it isn't a natural fire. So, that could be a village. A large ruined building in the middle of the strange desert about 24 miles to the north west. There is no mistaking that, it's definitely there, and Taku saw it on the way back from the beach as well. It's made of white stone, and covers a fairly large area. Another smaller volcano in the south-east (the larger one isn't shown yet). There's more mountains over in that direction. There is lots of jungle with the occasional patch of grassland and nicer forest (taller trees, good canopy, less undergrowth). By the way you are on the mountain marked '3'. The last 2 days are marked 1 and 2. Hope you can all see that. A quick sketch of the world - an altered version of RW geography. The Empire mentioned by Woe is mostly off the map, to the west. All other locations / language bases are shown. You are somewhere in the Red Circle. (You think). The colony at Salaya Sole is run by Siamese and Athayan merchant princes, and the main route leaves via Siam. You were following that route and had passed Siam by many days when you are boarded by the pirates who headed roughly north-west, probably to somewhere on the west coast of Siam, which is quite wild. Then the storm took you south west, into largely uncharted waters. No one really kept track of the direction or how far you went. Your approximate course is shown in blue. If you do get back on the ship, your best bet is probably to head north east and see if you can make it to Siam. PLEASE NOTE: THE hexes marked 1 and 2 in red are mostly jungle with some desert. Note - the red numbers indicate where you slept the night. Travel in the jungle and mountains is slow. Travel in the tall forest is twice the pace. Travel on the road will be even quicker. Teruk fills in your existing sketch of the island and gives you lots of information. There are numerous other ruins and details. The lizards do not go near Sulan, and there is a legend that all the 'old stones' are similarly protected. They (the lizards) are far less numerous in the south part of the island, past a line indicated on the map. No one knows why. Sulan is quite small (pop 200), and is the only village in the north. It only exists because of the ruined temple nearby. Near the beach where you landed, to the east in the jungle, there is a ruin, a place where ghostly figures of the old white wizards were sometimes seen. The lizard monsters are particularly numerous in the area around there. No one from Sulan has been there in 50 years. Further along the north coast to the east, there is supposed to be a ruined city in a bay where a fire breathing flying lizard has taken up residence. The creature has been there for over a hundred years and has amassed great treasures from the ruins of the city. The legend is that is sleeps most of the time, but has attracted followers to stay on guard - humans, monkey men, ogres, and others. Once again, this is an old story - no one from Sulan ever goes near the place. On the east coast, there are reported to be ruins where the Monkey Folk dwell. Some are friendly but some are dangerous and generally it is best not to go there. They mostly stay in that part of the island. Teruk has never seen one, but the elders in his village say the Monkey Folk some have magic. As you all know, there is a legend that long ago, people with white skin from the far north of the world made this island their temporary home, and built all these ruins. These were the wizards who made the race of Monkey Folk, with their magic. But they left, and no one knows where, or why. The closest village is on a lake to the south - the one you already saw. These people are OK, and Teruk's people trade with them sometimes. They catch good lake fish and have reeds for sale. There are many large villagers on the South Coast, some with populations of up to 1000 people. There are hardly any lizard creatures down that far. The evil 'Skull Cult' has apparently taken over two of these villages. The Skull Cult have magic, and have sent one of their members (the witchdoctor Ishakt ) up north to occupy Sulan. So far, he has succeeded. You are currently at 10am on day 7 and just about to hit the old road, which was built by the wizards and is maintained by the villagers whenever they can. Once on it you will travel much faster. You will move 3 full hexes on the road, and only require about a 3rd of the day to reach 'Home' (Sulan) on day 8. Teruk gets a stick and draws this full color map by Jon Roberts in the sand. The west road is the one you are on. The north east road goes to the ruined temple, in about half a mile. The south east road leads out of town and southward, heading into the jungle a short distance to a well known hunting spot. From there you can travel further south to the other villages. The chief's house is number 11. The temple to the fertility gods is number 6. The women's special house is number 14, where some of them go at various times to be away form the guys. The priests house is number 12 and the warriors ceremonial house is number 13. All the rest are just the houses of notable families. The protected area starts about one and a half miles down the west road. There is nothing in particular to mark the spot, the dinosaurs just never go past that point. Inside there are various well laid out vegetable and crop gardens, with some farm buildings and paths running to and fro. 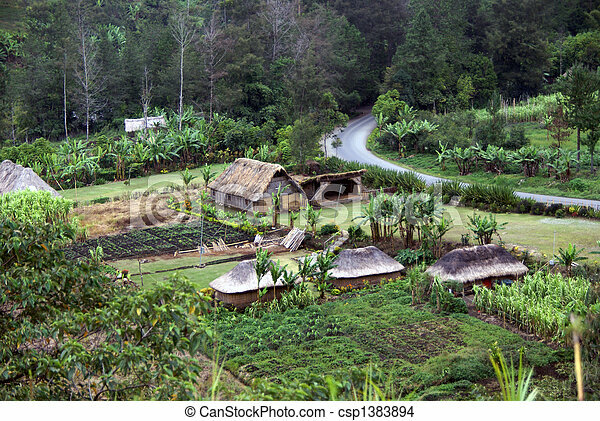 They grow crops for food, medicine, building material, clothing, beauty, various kinds of wine, and firewood. The area around the village looks a bit like this...sans the bitumen road. You have entered the protected area and are moving along, spread out, to either side of the road to the west of the village. No one has spotted you yet. You can see smoke rising from the village itself, but that is normal. You might be able to find a few farmers and ask them what is going on? Or you could just send the sneaky characters in to investigate. The village proper is still about a mile away. The temple is in an interesting location. The lake itself is the remains of a huge ancient volcano that is surrounded by a caldera in many areas. The temple is set into a section of the caldera that is only about 300 feet wide from the outside to the inside (where the lake is). The cliff is 100' high on the outside (the south side), and the door leads directly into the cliff. On the lake side, it is thought to be about the same height although Teruk wasn't exactly sure about that. There is no key to this map and no explanation of symbols so you don't know what much of it means. It's in OK condition - it's in the halfling's backpack right now. A better home might be a scroll case or map tube, even folded in a spellbook. If it gets wet, it's gone. The map is primitive and drawn in ink, in a hurry. Rivers, volcanoes and coasts and the only other things shown, except one road. The map is very old and has lots of notations on both sides, in a language you cannot read yet, but it is easy enough to work out that they refer to 11 different locations on the island as being of importance. If you have read language skills, you could try to use those. You know that you are currently at number 5. #11 appears to be of extra importance. It looks like it is in the middle of a lake or lagoon, and the existence of an island there is not shown on any of the other maps you have. The bird familiars did not see an island in that place, when they saw that location from the top of the mountain. Please note that HOME means Teruk's home, not the place you all started (which is the top of the blue line, on the cove beach). The blue line is the party's adventures so far: attempting to reach higher ground, tracking back west along the mountains to to go into the desert, but then meeting Teruk, going down the mountains south to meet the road, east to the village and temple, then going back along the road, detouring to the good fishing spot, and returning on a slightly different route to end up in the ruin at the well. It is now day 15. The well is circled in purple. The nearby ship is also circled purple, in its new location on the desert beach. The intended spot Maju wants to go to is the third purple area circled, to the east across the bay. The green line is roughly how Maju wants to get you there. The rangers estimate that will take 2.5, maybe 3 days to reach that spot. Travel in the jungle is slow. EDIT: If you wanted to decrease the journey time you could head south-east along the green line as indicated, then turn due north along the old blue line, to the beach where the ship originally landed, in the cove. That's an easy 2 days. You should note that dinosaurs seem to be more frequent in that part of the jungle near the ghost tower, than elsewhere. Teruk has told you this before. I;m using this caravel, closest I can find to an Arabic dhow. We can work out exactly where everyone is quartered at some point if needs be.